Here are 8 fun and easy St. Patrick’s Day crafts for kids that will delight, spark creativity and strengthen fine motor skills too. With March 17th just around the corner, I thought it would be fun to round up a few of our favourite St. Patrick’s Day crafts for you. These St. Paddy’s Day crafts and art ideas are all suitable for toddlers and preschoolers but elementary students will enjoy some of them as well. 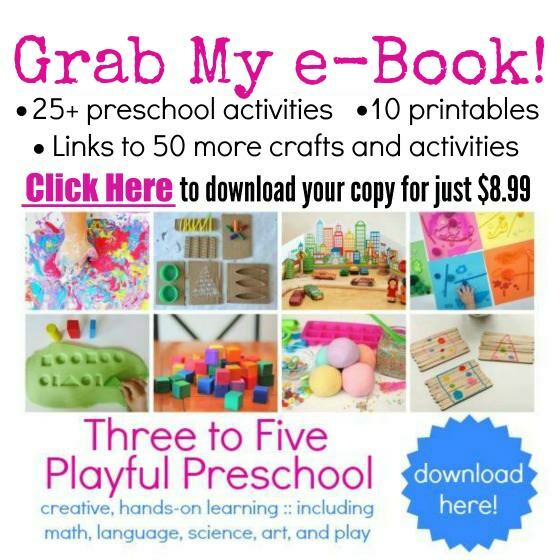 All of these crafts and activities use common, household materials, so they’re perfect for home, daycare, preschool or the classroom. 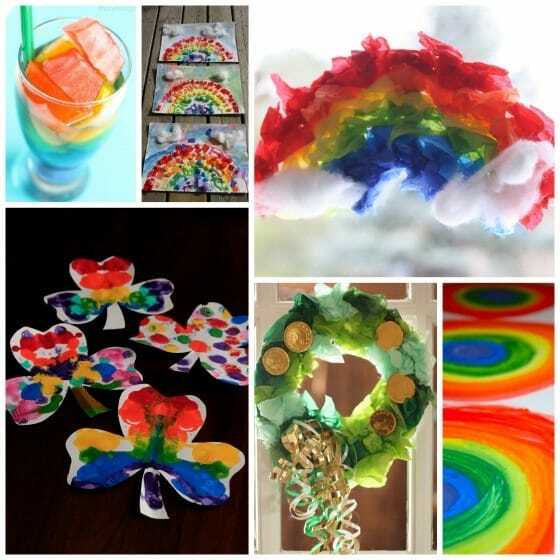 As you would expect, there are several rainbow crafts here – rainbows and St. Patrick’s Day always go hand and hand together – pot of gold at the end of the rainbow, and all that good stuff. 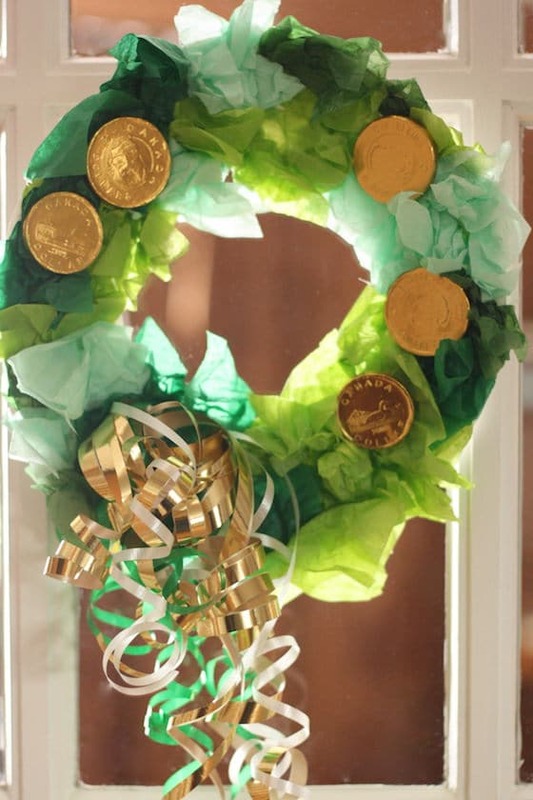 And speaking of “pot of gold”, one of our crafts is a “lucky green wreath” adorned with some gold coins. Chocolate coins wrapped in gold foil are perfect for St. Patrick’s Day crafting if you have a pot of gold craft to make. You can check all of these St. Patrick’s Day craft ideas out by clicking the links below. Our first St. Patrick’s Day craft is this Ink Blot Shamrock Craft. 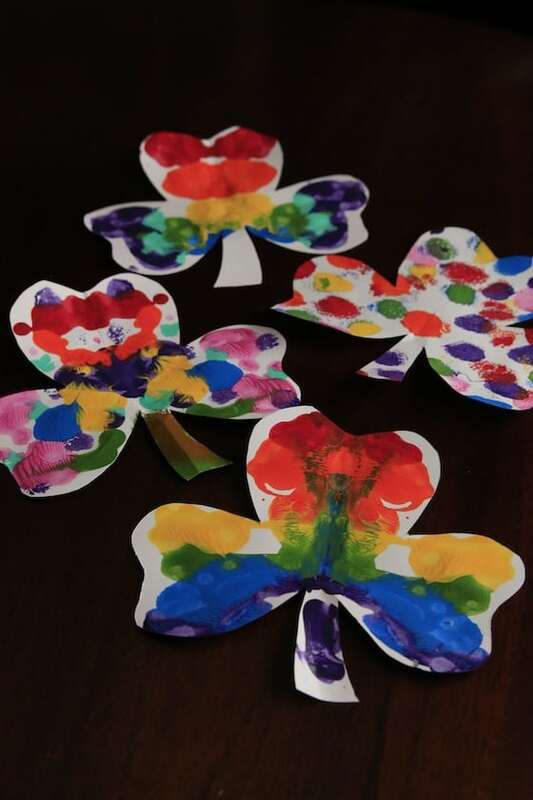 This project is a great St. Patrick’s Day craft for toddlers and preschoolers because the process is easy for little hands to do, and a lot of fun. Little kids find the ink blot process fascinating and they’re always so excited to see their results. Rather than making our shamrocks green, we’ve made rainbow-coloured shamrocks. Afterall, rainbows are fitting for St. Patrick’s Day, and with the holiday falling smack dab in the middle of March, the weather can still be quite dreary, so our rainbow shamrocks can really brighten your space. You can even turn this craft into a lesson about why we associate shamrocks with St. Patrick’s Day. The next St. Patrick’s Day craft is a paper plate rainbow mandala that’s perfect for toddlers, preschoolers and elementary students. 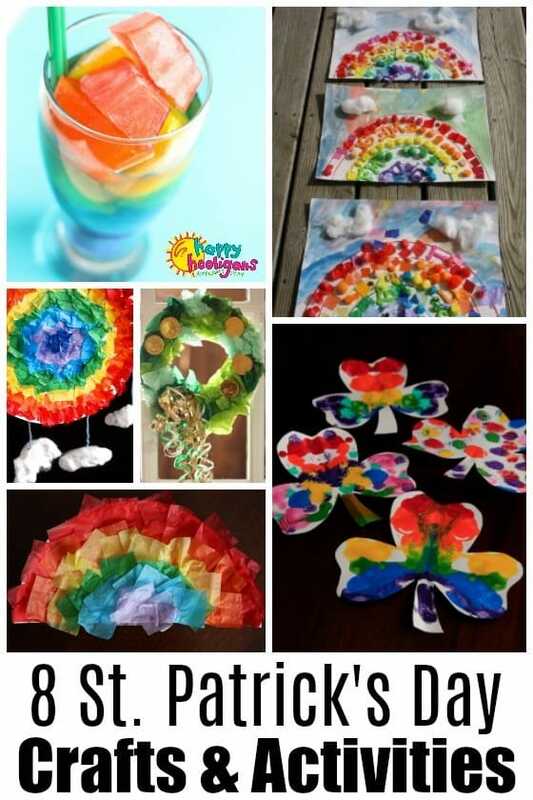 This craft provides a great opportunity for kids to learn rainbow colour order AND a really cool way to draw a rainbow. 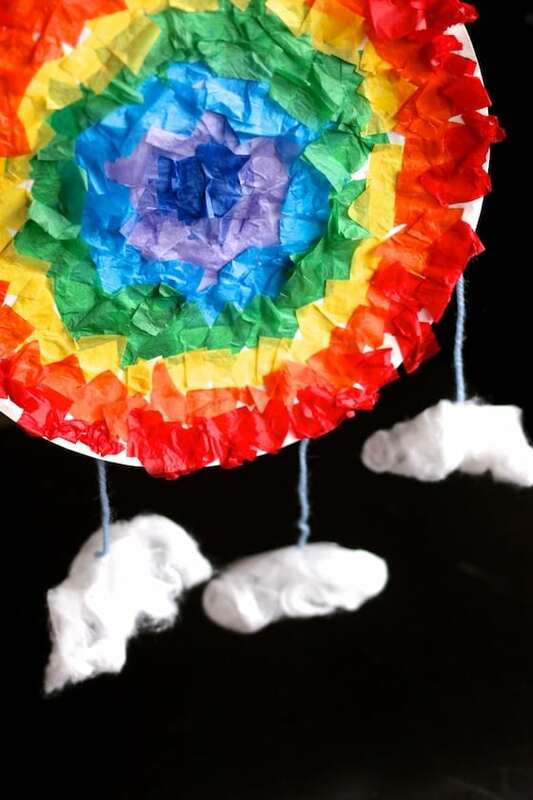 Suspend some fluffy white clouds from your mandalas, and these rainbows will be perfect to hang from the ceiling of the classroom, or in a window on St. Paddy’s Day. 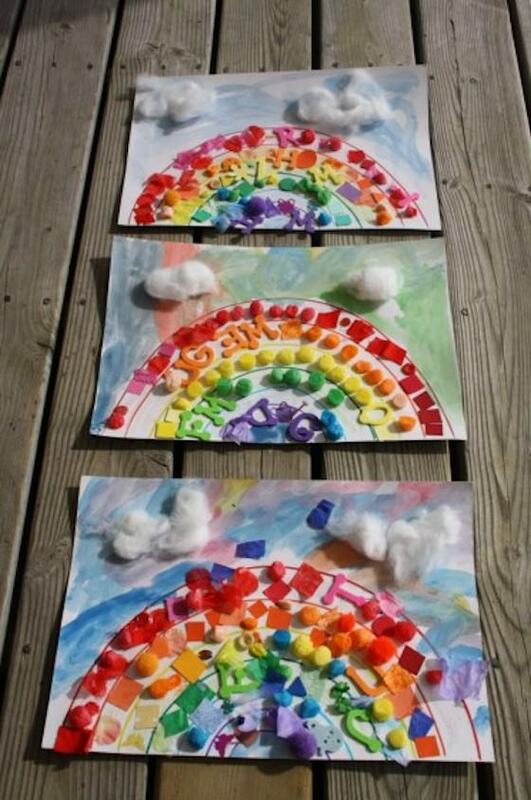 If you’re exploring rainbows with your toddlers and preschoolers, here’s a terrific activity for them. 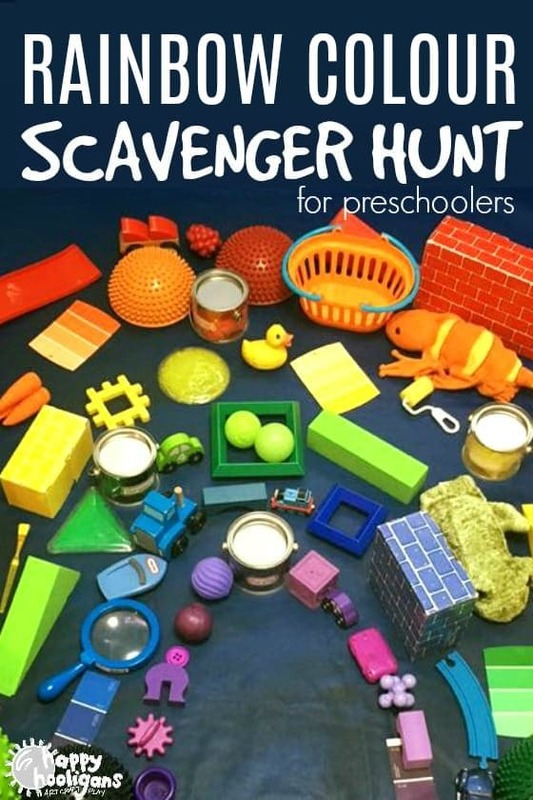 This rainbow scavenger hunt is simple to do in a toy room or classroom, using the items that you have right there in the room. It will get the kids up and moving, it helps develop critical thinking, and it’s a wonderful way to work on colour recognition and rainbow colour order with little kids. 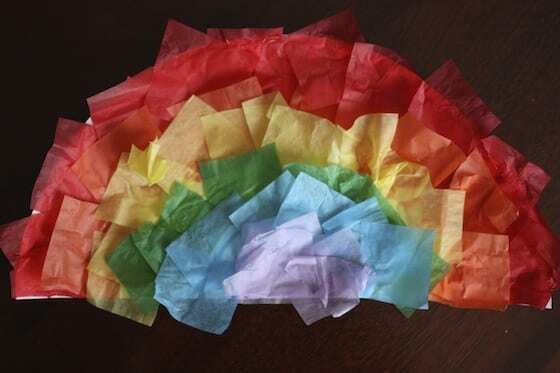 This tissue paper rainbow is a great St. Patrick’s Day craft for kindergarten or for toddlers or preschoolers. It’s similar to the rainbow mandala. Young children love crafting with tissue paper. 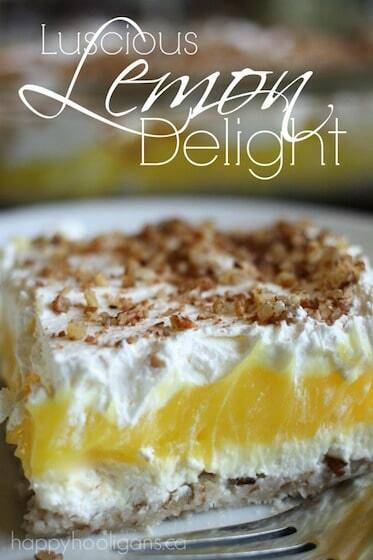 It looks, feels and sounds so lovely. Kids can crumple their tissue paper before gluing it to their rainbow, or they can lay their pieces flat like you see in the photo above. Handling tissue paper helps develop fine-motor skills because a delicate touch is required to pick up and separate the pieces from one another. This activity also teaches about colour order and following a colour map. 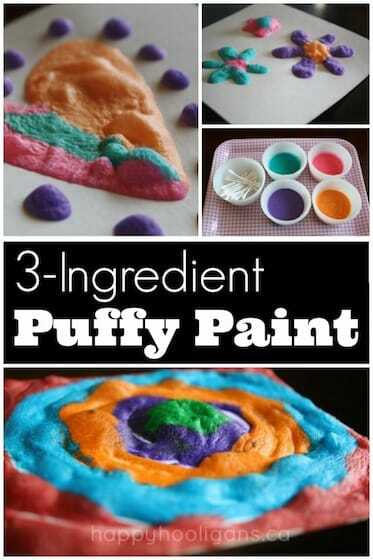 Here’s a fun rainbow treat to serve the kids for St. Patrick’s Day. 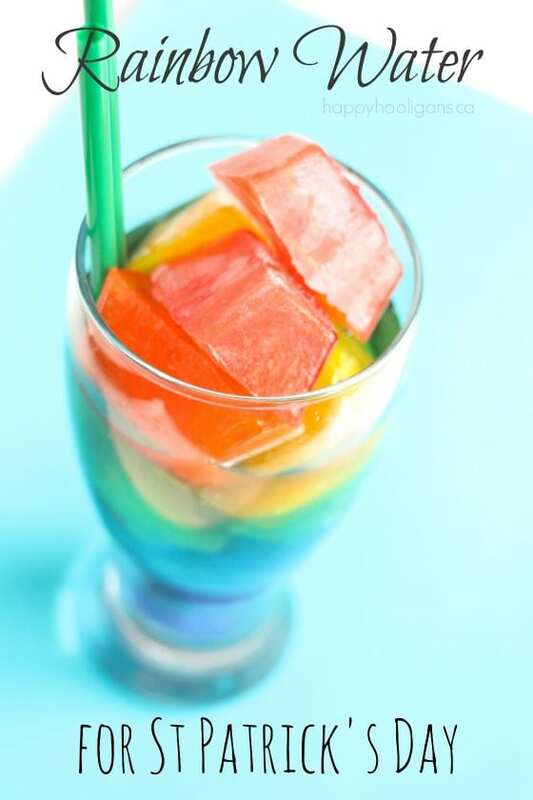 Rainbow Water is super-easy to make and it’s sugar-free. 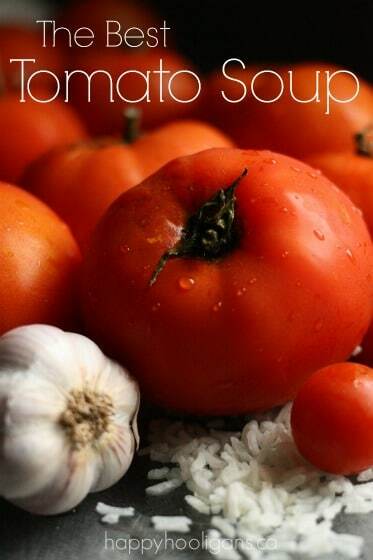 You just have to remember to prepare this the night before. 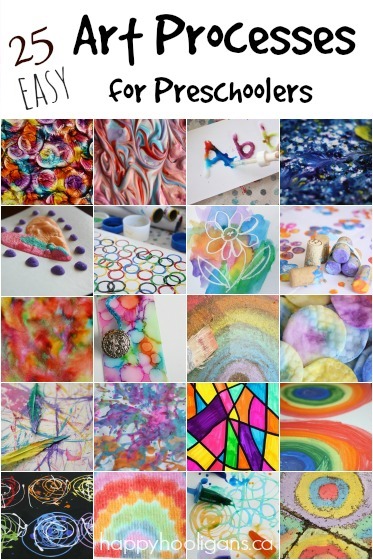 My daycare toddlers and preschoolers loved making this tissue paper rainbow with colourful odds and ends from our craft cupboards. It was a great colour-matching activity and the results were really pretty.This activity was also great for helping to develop fine-motor skills as the pieces they were working with were quite tiny. To finish off the project, the kids painted a blue sky all around their rainbows. 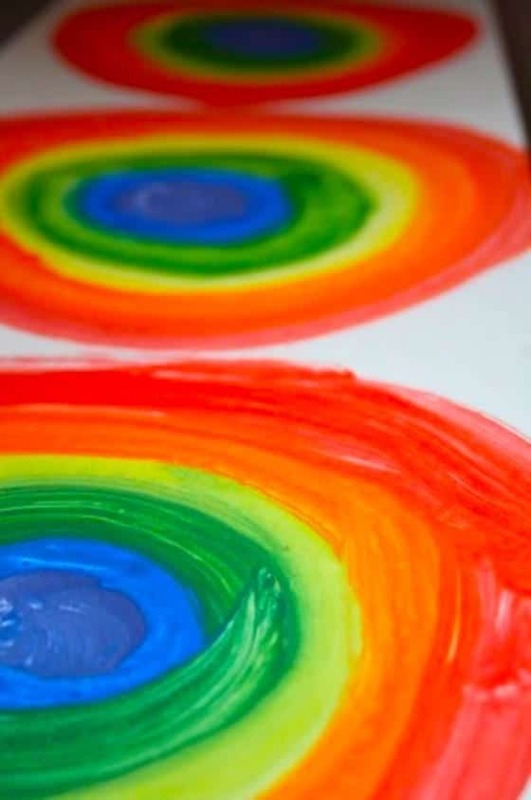 These painted rainbows make a great St. Patrick’s Day craft for elementary students. They’ll love the way you paint these rainbows. It’s the coolest! Circle, circle, circle, SNIP! You can decorate with these rainbows in all kinds of ways. We turned ours into a St. Patrick’s Day bunting for our playroom. Our last two crafts (above) are featured together here in one post. Kids of all ages will love making our lucky green wreath for St. Patrick’s Day. Once again, tissue paper is the star of the show for this easy St. Paddy’s Day craft, and the gold coin and gold ribbon make it shimmer! Just like a pot of gold. 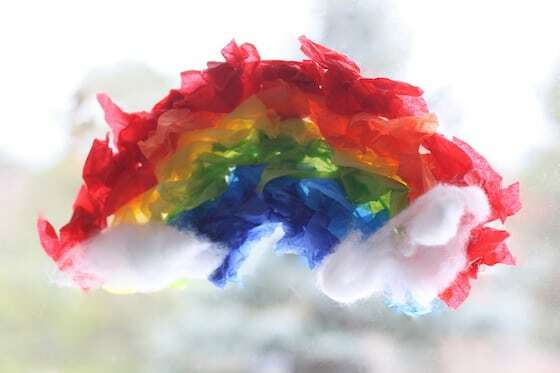 These tissue paper rainbows are similar to the other rainbows in our round-up but we’ve added some fluffy clouds at each end. You could get creative and add a pot of gold to one end of this rainbow too! I truly hope you’ve enjoyed these simple but adorable St. Patrick’s Day crafts and activities and I hope your kids do too. 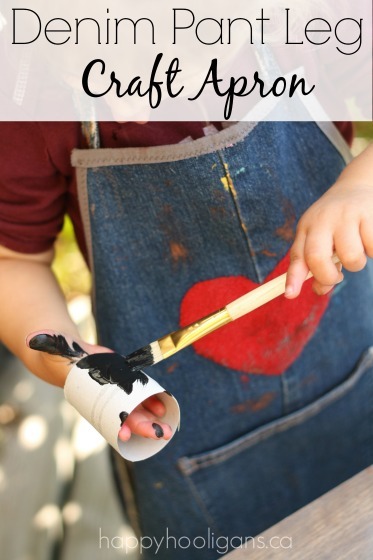 Whether you’re crafting with toddlers, preschoolers or elementary aged kids this St. Patrick’s Day, you’re bound to find a project here that will please your kids.